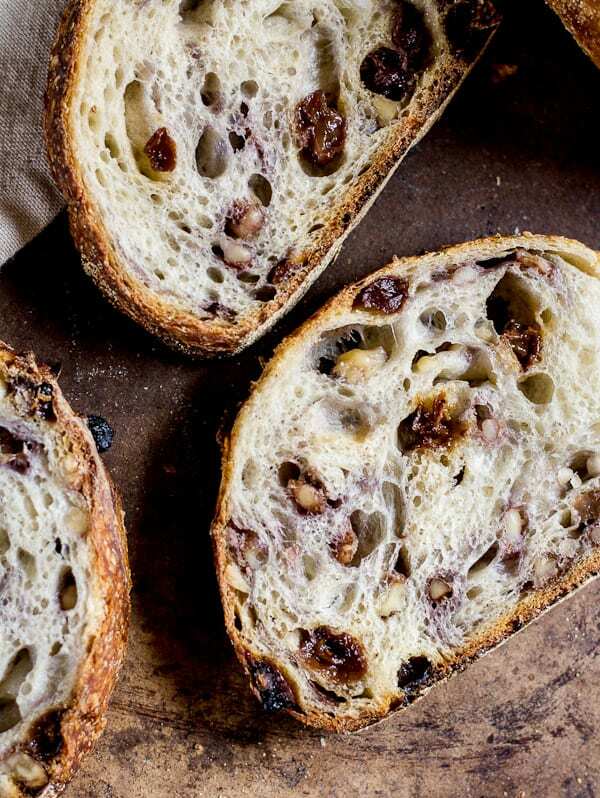 Country sourdough with walnuts and raisins! You’re lucky this bread even made it to post, because I kept picking at it as I was trying to shoot. It was nearly impossible to stay away! 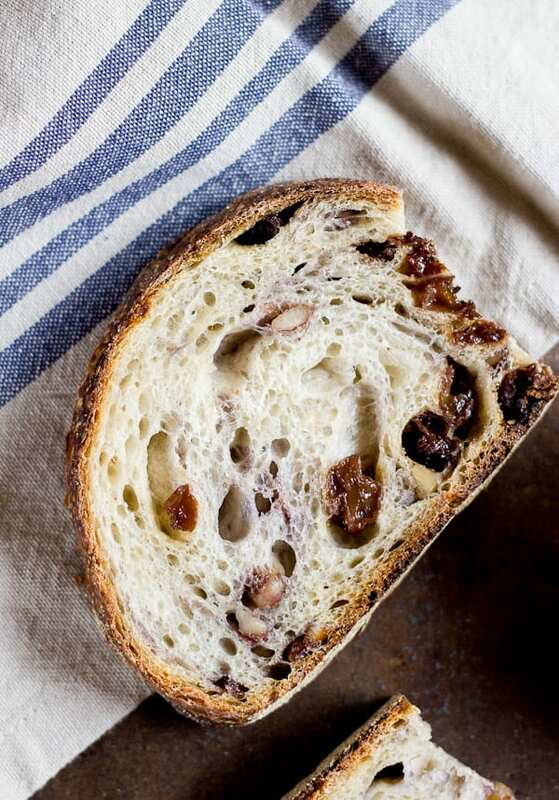 The inside is so chewy, studded with plump organic raisins and bits of crunchy, toasty walnuts. Raisin bread reminds me of when I was kid. My mom used to slather it with cream cheese and pack it for my lunch (bless you, Pepperidge Farm). 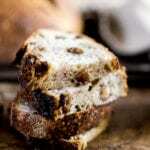 I still love raisin bread to this day, and I’m proud to share my homemade grown-up version. Baked in Dutch oven @450 F for 20 minutes (covered) + 40 minutes uncovered. Cracked open the oven door during the last 10 minutes of baking to harden the crust. I don’t blame you (I have a headache after reading that myself…)! Refer to my in-depth Beginner’s Guide for everything you need to know about sourdough. As always, bread baking is as much of an art as it is a science. What works for me, may or may not work for you. Ingredients, starters, and overall environment play a key role in how your bread will turn out. So, get to know your dough. Tweak as you go. Weigh your ingredients. Trust your instincts. Own your style. Eat your mistakes (breadcrumbs, French toast, bread pudding- it’s all good). Most of all, have fun. Enjoy this recipe! All ingredients are weighed using a digital kitchen scale for best results. This is the one I use. To make the dough: In a large bowl, combine the starter, water, and bread flour. Squish everything together with your hands until all of the flour is absorbed. Cover with plastic wrap and let it rest (autolyse) for 1 hour. Soak the filling: Add the chopped walnuts and raisins to a bowl and cover with ½ cup of water. Leave to soak while the dough is resting. Drain before using. Roughly chop the raisins. To the dough: Add the salt + ½ tsp. of water (to help it dissolve). Add the walnuts and raisins. Lift and fold the dough over itself several times, and squish with your hands to incorporate. The dough will tear slightly as you fold, and the salt will not fully dissolve. Don’t worry- this is normal. Work the dough as best you can until it comes back together into a rough ball. At this point, you shouldn’t feel any grains of salt beneath your hands. Bulk fermentation: Cover your bowl with plastic wrap and a clean kitchen towel. Leave it in a warm, sunny spot to rise. Your dough is ready when it no longer looks dense, and has increased in volume about 1½- 2x its original size. This can take anywhere from 3-12 hours depending on the temperature of your ingredients, the potency of your starter, and surrounding environment. In the winter, I make my dough in the afternoon and leave it to rise overnight at room temperature (65 F) for about 12-18 hours. In the warmer months, I bulk ferment in the fridge to control the rise rate and to prevent over proofing. *See note below. Stretch & fold: To strengthen your dough, do a series of stretch and folds every 30 minutes for 2 hours during bulk fermentation. Simply gather a portion of the dough, stretch it upwards and then fold it over itself. Rotate the bowl ¼ turn, and repeat until you have come full circle. You will have completed 4 folds. Try to keep the nuts and raisins tucked into the dough and not on the outside to prevent burning. Cut the dough: To cut and shape the dough, divide your work surface in half; lightly flour one side (for cutting) and leave the other half clean (for shaping). Remove the dough from the bowl, and place onto the floured section so that it does not stick. You do not need to ‘punch down’ the dough; it will gently deflate as you fold and shape it. Cut the dough in half to make 2 loaves, or leave it whole for a single loaf. Shape the dough: Use a bench scraper to move your dough to the non-floured section (if there is any flour present, it will be difficult to shape- brush away any excess). Gather the dough, one side at a time, and fold it into the center. Flip the dough over and place it seam side down. Using your hands, gently cup the sides of the dough and rotate it, using quarter turns in a circular motion. You can also pull it towards you to even out the shape. Repeat this process until you are happy with its appearance. Second rise: Place the dough into a cloth lined 8-inch basket, bowl or floured/lined proofing basket. It will need to rise again, this time for a shorter period, about 45 minutes to 1 hour. It is ready when the dough is slightly puffy. Prepare the baking vessel: Preheat your oven to 450F. Generously coat the bottom of a Dutch oven(s) with cornmeal to prevent sticking. Sprinkle a good amount of cornmeal on top of the dough as well (this will be the bottom once it’s flipped over). Carefully invert the dough into the pot, cornmeal side down. Bake the bread: Place your bread into the oven (lid on) and bake for 20 minutes. Remove the lid, and continue to bake (uncovered) for an additional 40 minutes or until deep, golden brown. During the last 10 minutes of baking, crack open the oven door. This allows the moisture to escape, leaving your bread with a crisp crust. You can also take the internal temperature of your bread to double check that it is done. For sourdough, it should read about 205 F.
Because sourdough does not contain commercial yeast, it takes considerably longer to rise. In the summer months, it can take anywhere between 3-4 hours @ 85 F whereas in the winter, about 8-12 hours @ 65 F. It is very important to watch your dough and not the clock. It’s ready, when it’s ready. You have now created a huge problem in me because I can’t stop staring at your bread! Wow! Just looking at this picture makes my mouth water:) I tried making it, and was unsuccessful. I woke up to find that my bread was flat again. Oh, and also very gummy:( I am still going to bake it. Unfortunately, i will not use a dutch oven, but a regular bread pan with foil. Hi there! if your bread is flat, it didn’t rise properly. Are you using tap water? Sometimes the chemicals can kill your starter causing it not to rise. Use bottled or filtered water next time. If it was gummy, it was under baked and/or you cut into it too soon after baking (I’m often guilty of this- waiting it too hard!) Give it a good 1 hour before you slice. 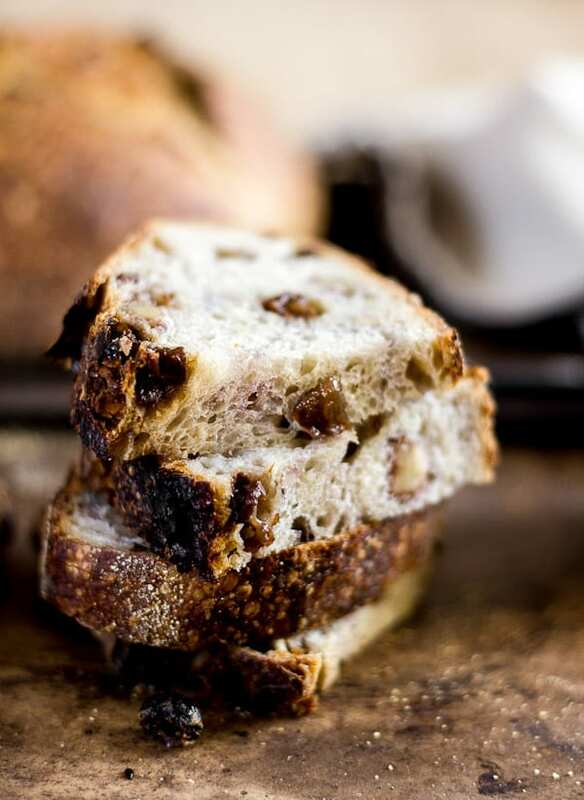 Gorgeous bread, I love the combination of walnuts and raisins! This bread looks amazing, like something I would buy from the bakery! What a great job! What a gorgeous loaf of bread. I wish I could taste it! You should sell that stuff! This bread is spectacular!!! Just when we think you can’t do any better, you go ahead and make this incredible bread with photos you can practically taste! This bread looks like it would make the most amazing morning toast ever, thanks for the inspiration to get baking! Thanks for the lovely posts on sourdough! I have made the regular sourdough with great results. I just made the raisin walnut variety and it was a little spongy, and the bread was light purple from the raisins. Did you cook at 450 degrees the whole time or reduce to 400 degrees after the bread went in the oven? Does this bread take longer to cook? Also, I wonder why my bread is purple, maybe too much stretch and fold? There is more water in this recipe does that result in a softer outcome? Your pictures look great so that is what I would like to achieve! Thanks for any advice! When I make this bread, I usually bake at 450 F the whole time. However, I have lowered it in the past to 400 F; I could smell the raisins burning. My recommendation would be to start out at 450 F, check it after the lid comes off, and then lower the temperature if you think it’s browning too fast. Was this something you experienced? Your bread is purple because of the raisins. When doing the stretch and folds, try to keep the fruit and nuts tucked into the dough as best you can. This is a little tricky but definitely helps. It will also prevent the fruit from burning on top of the bread. How long did you soak them? Perhaps they were very soft to begin with. For your dough to actually turn purple means they were too soft/wet. I would skip the soaking step next time. Now, with regards to texture you mentioned spongy and soft- was your baked bread to too wet? Or undercooked? More water results in more holes in the crumb. However, in your case it sounds like your bread might’ve been undercooked and too much moisture in your oven. Next time, take the bread out of the oven during the last 10-15 minutes of baking and place it directly on the rack. Let it finish out baking. This will harden the crust. I hope this helps! If you have any other questions please let me know! :) Good luck. Your loaves look magnificent. Thank you for sharing this recipe! I tried to make it last week. I followed the recipe the best I could. However, my loaves turned out kind of dense, without any holes in them. Also, I do not own a dutch oven, so I baked them in cast iron skillets. Do you have any insight into how I could improve my sourdough raisin loaves next time to resemble yours? Also, do you know if it would work adding cinnamon to the dough? Are you a beginning bread baker? Usually, when loaves are very dense and heavy it’s because the bulk ferment was too short. How long was your initial rise? I prefer a long, overnight rise about 12-14 hours. Other factors to consider include inaccurate measuring (weigh your ingredients using a kitchen scale) and inactive starter. Also, watch the timing of your second rise; try 30 minutes. Does your cast iron skillet have a lid, i.e. combo cooker? The lid is essential to trap in steam and moisture which helps the bread to rise in the oven. When moisture is absent, sometimes the outside of your loaf will harden too fast, hindering the rise process, and becoming hard and dense. This happened to me all the time when I first started baking and now I only bake in a pot with a lid. The results are consistent and reliable. In terms of holes- this is a high hydration (wet) dough. So there should be plenty of holes in your finished loaf. Again, make sure to weigh your ingredients to make sure that you are not adding too much flour. For next time, follow my advice above- Weigh your ingredients, increase your bulk ferment time, shorten your second rise, bake in a covered pot. As for cinnamon, perhaps 1-2 tsp? This all depends on your personal preference! Thank you very much for your response, Emilie! I will try all of your ideas next time I bake this recipe. Yes, I am new to baking with sourdough. I will definitely check out your sourdough beginner’s guide. Perhaps, it is also high time to invest in a new kitchen scale and a dutch oven?! Best wishes to you! I’m a newbie to sourdough, but every loaf I’ve made so far has been fantastic — thanks to your detailed directions, especially in the beginners’ guide! To tag onto Maria’s comments, I haven’t used a dutch oven — just a regular loaf pan covered with tin foil and that seems to work just fine. And I just made this recipe and added 1T cinnamon and 1T sugar along with the salt — flavor seemed just about right, and I may even add more next time. Curious about the folding. If I prove overnight in a cool environment (which I plan to), when should the folding be done? at the beginning of bulk? towards the end? Please advise. Thanks! Stretch and folds should be performed every 30 minutes for the first 2 hours of bulk fermentation. So, for example, if you mix up your dough at 9AM your first fold will be at 9:30 and so on… does that make sense? Hi, Could this bread be made with whole wheat flour and if yes, what are the measurements exactly to be used? Besides the walnuts and raisins, this recipe is almost identical to your wonderful basic sourdough bread recipe. I see, though, that it calls for 350 g of water, while the basic recipe calls for 250 g. Is this correct, or an error? 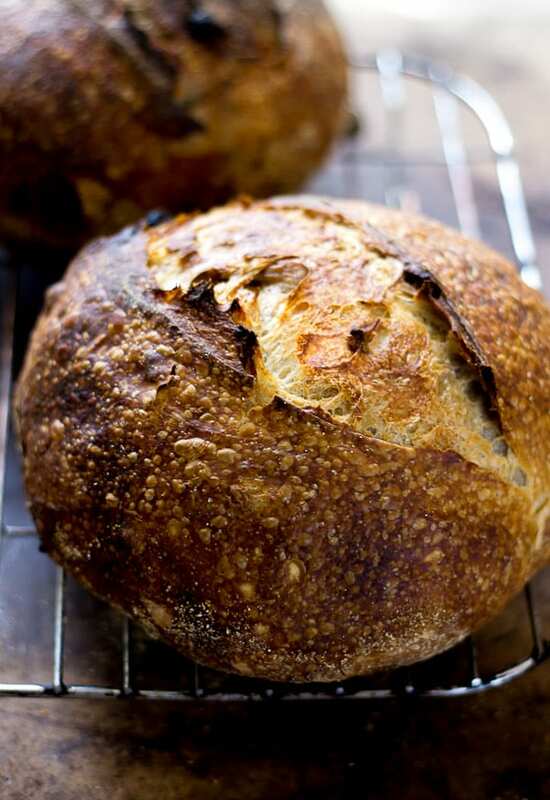 Thanks again for your wonderful website – I plan to explore it more once I settle down from my sourdough infatuation! What’s great about bread baking, many of the recipes are similar. Adding more water turns it into something entirely new. For this recipe, 350g is not an error; it produces a different inside crumb. I’m in the middle of baking this but it looks like it’ll end up being a flat, dense one. After 2 hours of bulk fermenting last night (with folds every 30 min), I left it in 73F for 10 hrs. It looked really wet/sticky so I added a few dollops of flour, folded gently again and let it be for another 1.5 hrs while I preheated the oven. Any thoughts on why my dough was so sticky for shaping? Do you pat dry the walnuts/raisins? Followed the recipe to the gram…but conundrum. It’s hard to say without seeing the dough. But, if it was too sticky, that usually means there is too much water in the dough OR the brand of flour doesn’t absorb that much water. I would make sure the raisins and walnuts are dried well (you can pat them, if preferred) or don’t soak them at all. I don’t always soak my fillings and this will definitely help. What brand of flour are you using? Ok great! How did it come out? Do you not make a leaven with this? My second attempt at sourdough, so lots of questions! Hi there! No, I do not include a leaven build in my method- it’s not necessary if you don’t want to do it. Just use your starter straight from the jar! Am reading the recipe correctly that the Dutch oven is not preheated? I have not tried using a cold Dutch oven. I usually place it in the oven to let it heat up with the oven. You are correct; the pot is not preheated. You can do it either way, it’s up to you! I prefer a non preheated pot because it’s easier to maneuver and you’ll avoid burning yourself. A preheated pot will get you a slightly higher rise, but not in all cases. Ahhh, now I know why my loaf came out quite overdone (almost burnt actually). I always put my sourdough loaf into a preheated pot and so I did the same to this loaf out of habit. Anyway I just cut off some of the burnt crusts and it was absolutely delicious. Thanks for the sharing the recipe. You are quite welcome! Enjoy! I tried this recipe to the letter and I ‘m glad I did. It came out perfectly just the way I like it. Thank you for sharing this. And by the way, I link your recipe in my blog. I am new to sourdough. Baked your basic sourdough bread followed by the this. Both turned out fantastic. I didn’t have raisins so I used dried fig and apricot. I am going to get your book! Thank you!! Emilie, I know bread baking is a science with exact measurements. If I wanted to add a whole cup of my sourdough starter what other adjustments should I make? I know by doing so I will end up with a lot of dough but I bake bread weekly so this would be ideal because I could freeze the extra! Also, would I freeze the extra before letting it rise overnight? I love your blog! Hi there! Do you mean you’d like to add an additional 1 cup (about 100 g) of starter to the pre-existing recipe? If so, the total would be appx. 1 1/4 cups (about 250 g) in total? Thanks! Today, I baked your bread. Just don’t know, if the dough was supposed to be liquidy. The loaf turned ok, but I had a hard time to place it into a baking pot,it rolled under itself. Tooo soft!? I also baked it the same day, bcs it has risen nicely. It’s hard to say without seeing a picture of the dough/finished loaf. However generally speaking, this dough shouldn’t be very wet. For best results, make sure to weigh your ingredients including the liquid for accuracy. If you’re still running into trouble try reducing the water by 20g until you have reached your desired consistency. It could be that the brand of bread flour you’re using doesn’t absorb that much water (resulting in a wetter dough). Hope this helps! One more question— how do I make 50/50 whole wheat and bread flour starter, using your traditional one with AP flour? Hi! 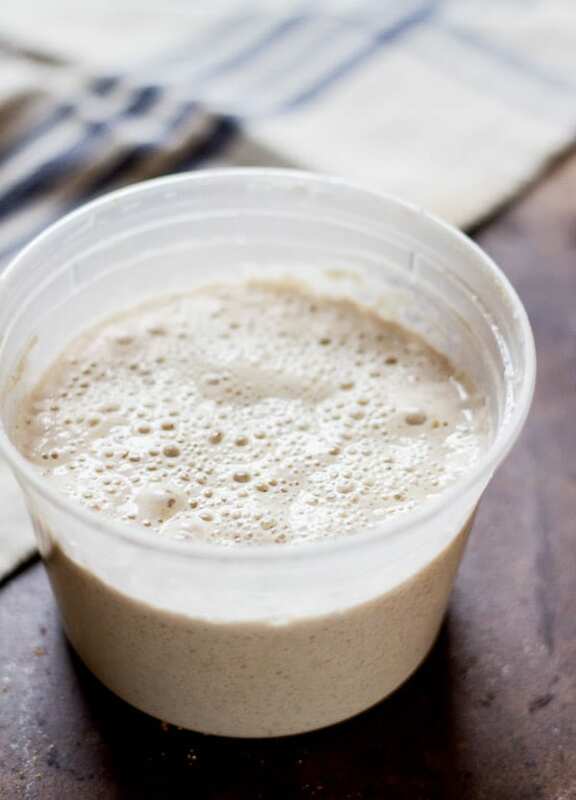 To covert your starter, I would feed it with whole wheat flour instead of all purpose flour. It might take a while for your starter to adjust, but eventually it will get there. This bread is excellent! I still have a lot to learn about sourdough but I was very happy with how much my loaf resembled the one pictured with the recipe. The crumb on mine isn’t quite as holey, but my crust is golden, and blistered and delicious! The dough was the wettest, most slack dough I’ve worked with so far and I was tempted to add more flour, but didn’t. It rose well both in the bulk fermentation and the second rise. I didn’t use cornmeal to prevent the dough from sticking to the proofing basket or my Dutch oven. I lined the basket with a linen cloth and dusted it well with rice flour. To transfer the wet, fragile dough to the Dutch oven I covered the top of the dough with a round of parchment paper, inverted the Dutch oven over the dough and gently flipped the Dutch oven and proofing basket over. The dough dropped out effortlessly and the parchment paper, which was now at the bottom of the Dutch oven, prevented the dough from sticking. I didn’t have raisins, so subbed coarsely chopped black mission figs, which added a chewiness to the bread. Thanks for a great recipe and the detailed instructions. Hi! This recipe looks great & I would love to try it this weekend- just to clarify on the bulk fermentation, it’s 100 degrees in Phoenix today (!) so I’m considering making the dough this afternoon and bulk fermenting overnight in the fridge- do you think that would be ok, and would I do the turns just for the first 2 hours? I’m so keen to try this! I’m fairly new to sourdough bread-making. The 2 hours of the stretch & fold process — do I just do this anywhere within the bulk fermentation time? It’s cold here in Australia, so I’ll need a longer bulk fermentation time. Also, how do I get a lovely blistered crust like yours? You say to line your brotform, but every time I line it, it doesn’t get the lovely swirls. I have a liner that came with the basket, but that is no thicker than a towel – possibly thinner. What do you suggest?